2015 was a bumper year for garden visits. I’m almost overwhelmed when I realize how many gardens I visited — well over 100 by a quick count. Some days, I found the experience exhausting; every day it was fun. My year of visiting gardens started in February when I saw two outstanding gardens in South Carolina. 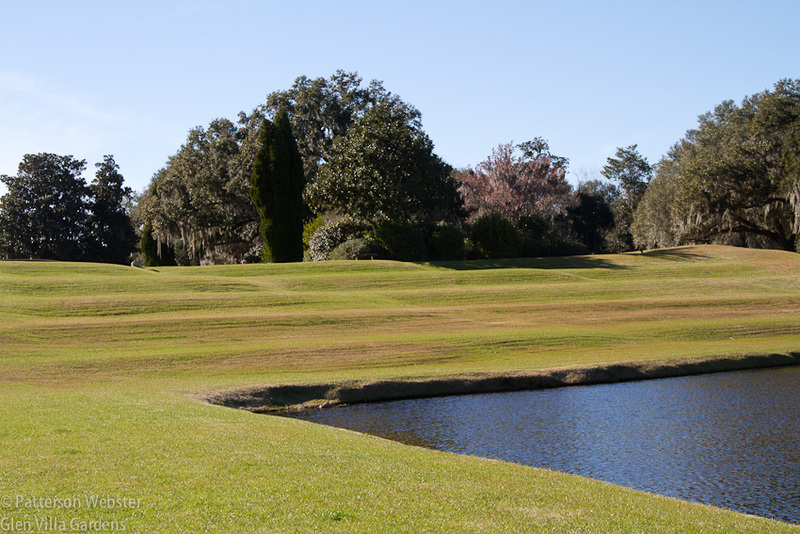 Middleton Place lived up to its reputation as one of America’s premier historic gardens. 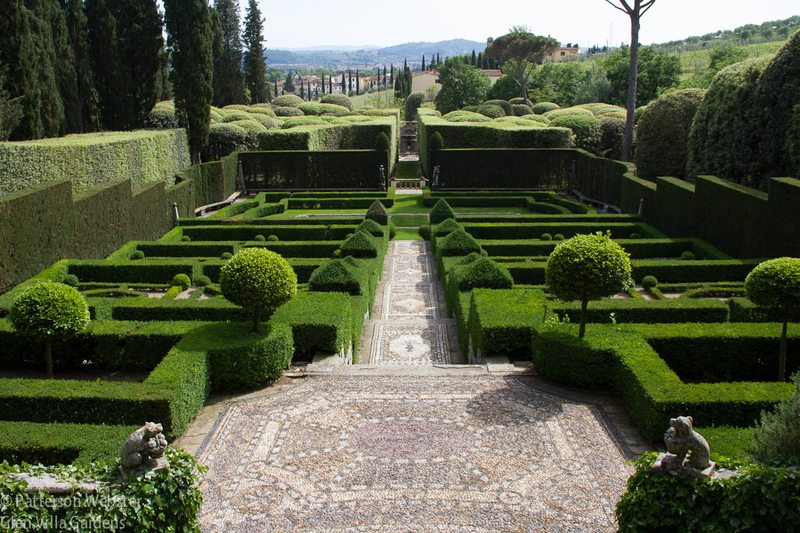 Begun by Henry Middleton in 1741, the garden follows the principles of André Le Nôtre — which means that order, balance and focal points enlivened by the occasional surprise guide its design. Still, the garden’s most distinctive feature is very much its own. Where else can you find terraces and artificial lakes laid out like butterfly wings? To show the butterfly wings, I needed to be in a low-flying airplane or have a drone camera. Or, I suppose, to take wing myself. Next up was a wander through Magnolia Plantation, a romantic garden that has been open to the public since 1870. The azaleas weren’t in bloom when I was there, but the gardens themselves offered views into a past that would have been romantic for some, difficult for others. 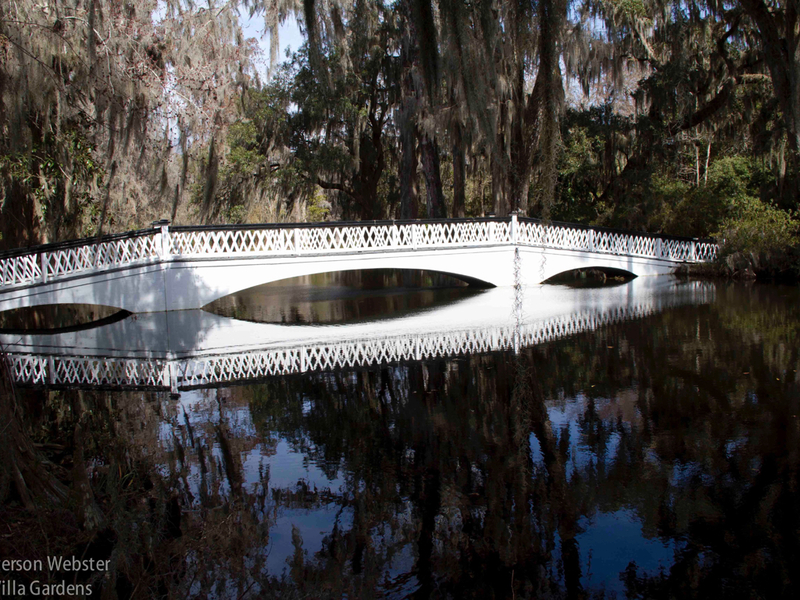 This bridge is one of the most photographed features at Magnolia Plantation. To me the small ovals reflected in the black water look like narrow, elongated eyes, and this made me feel like the bridge was looking back at me. The Audubon Swamp Garden next door to Magnolia Plantation was equally interesting. Although the bird life was not at its best according to regular visitors, for me it was fascinating to see herons building their nests and ducks paddling through waters that for them were full of tasty morsels. 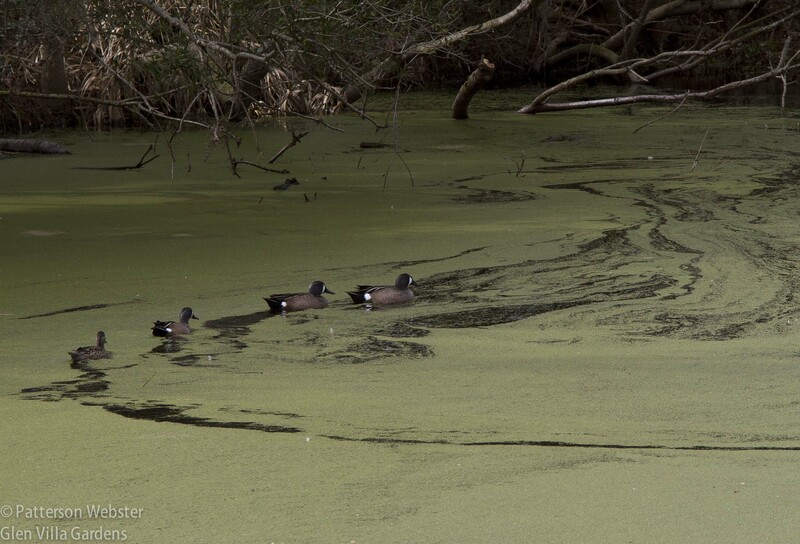 I like the swirling patterns the ducks formed in the swamp weed. 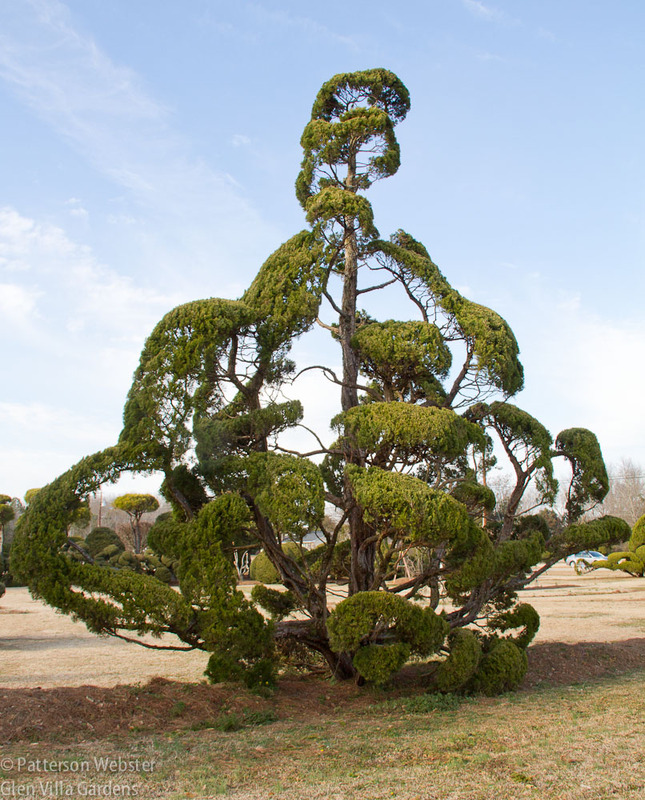 Pearl Fryar’s topiary garden was the eye-opener in March. Who would ever have expected to see a galleon sailing across the lawn in a small South Carolina town? Could Edward Scissorhands do this? 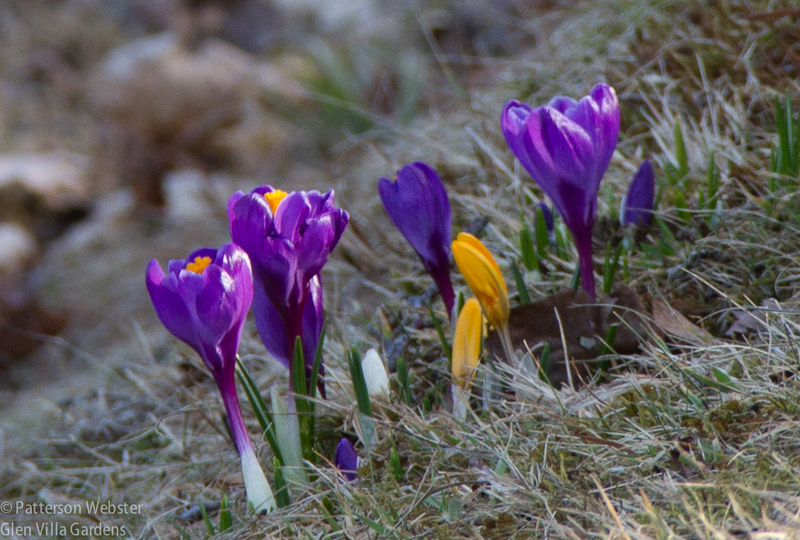 April found me home in North Hatley, Quebec, where the crocus were blooming and I lay back to enjoy a rest. Crocus on the lawn at Glen Villa, April 2015. 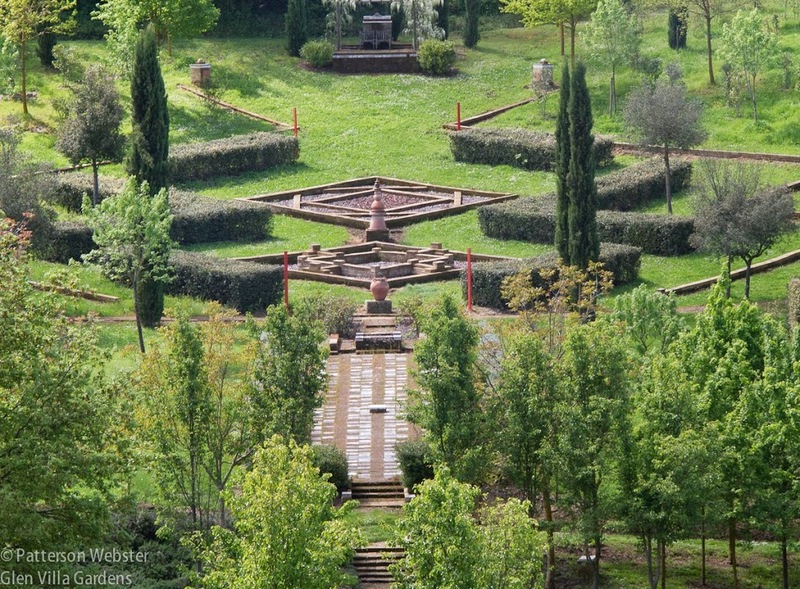 Formal elements found in traditional Italian gardens are given a new twist at Bosco della Ragnaia. 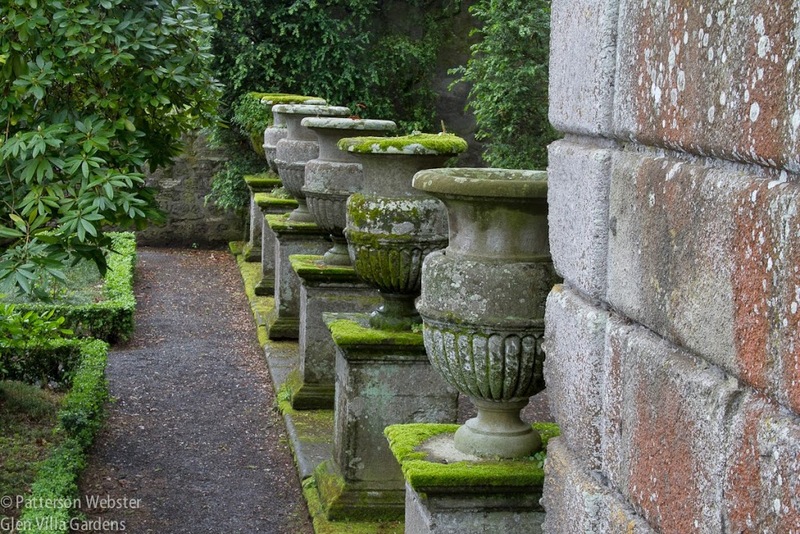 Mossy urns on a terrace at Villa Lante create a sense of rhythmic movement. 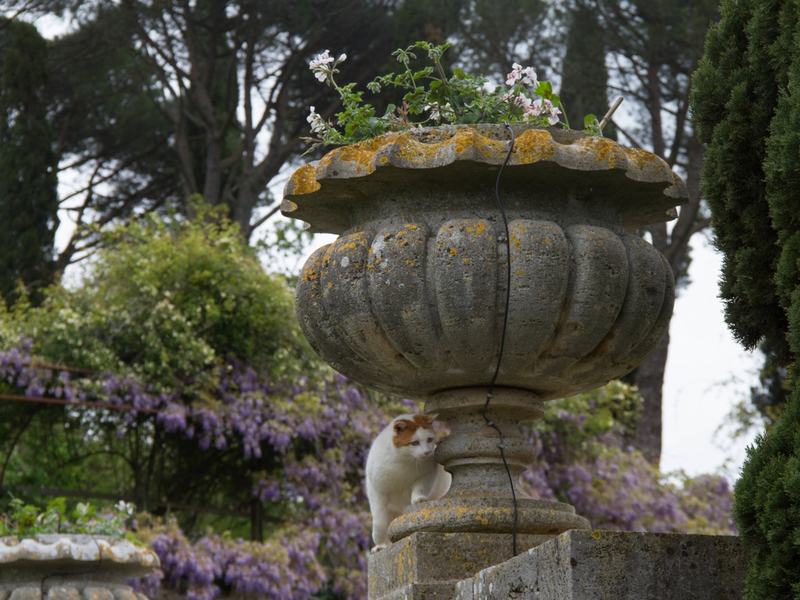 A cat slinks its way round one of the many urns designed by Cecil Pinsent for La Foce. 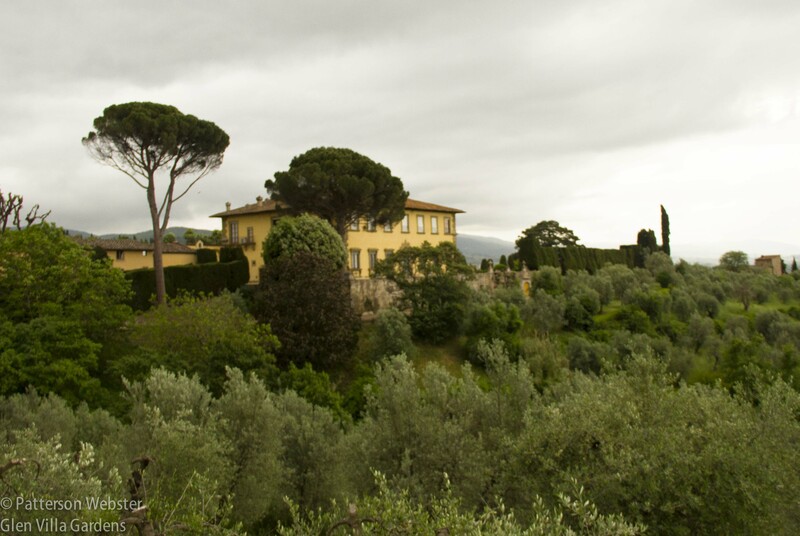 Villa Gamberaia packs a lot of garden into a relatively small space. Wonderfully coloured pebble mosaics create a carpet on a landing in the Italian garden at Villa I Tatti. 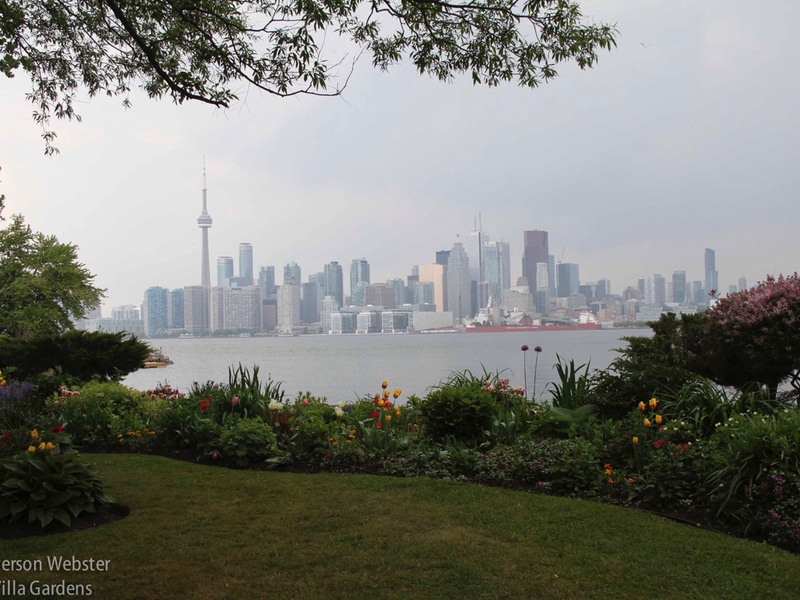 Our first garden visits were on the Toronto islands. From there we had a good view of the city’s skyline. 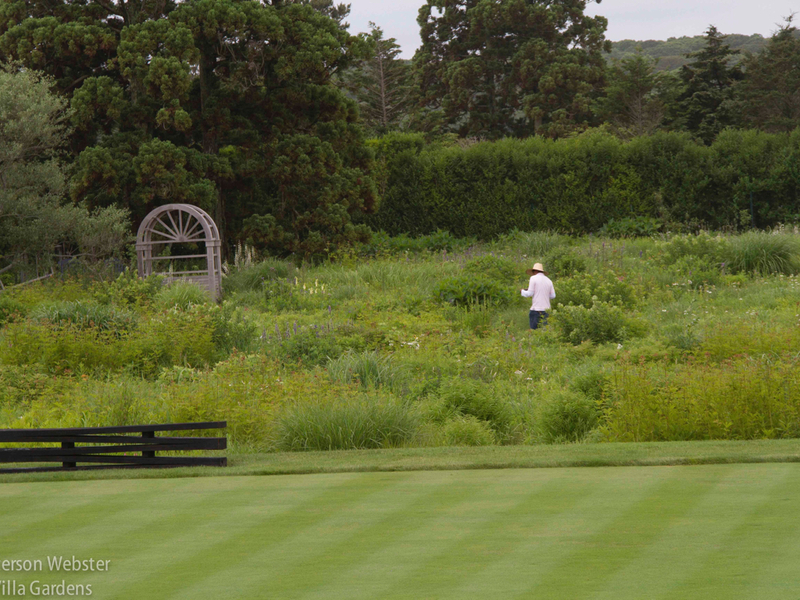 Before the Fling began, I spent a day at a delightful garden north of Toronto. Lilac Tree Farm is the creation of Brian and Marian Bixley. 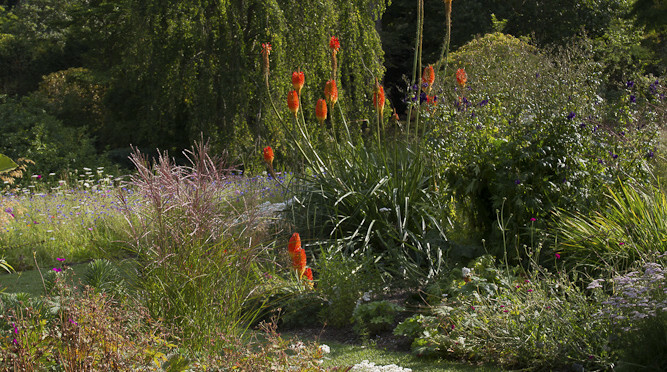 They’ve been working on the garden for thirty or more years now and have created an amazing abundance of flower-filled spaces. 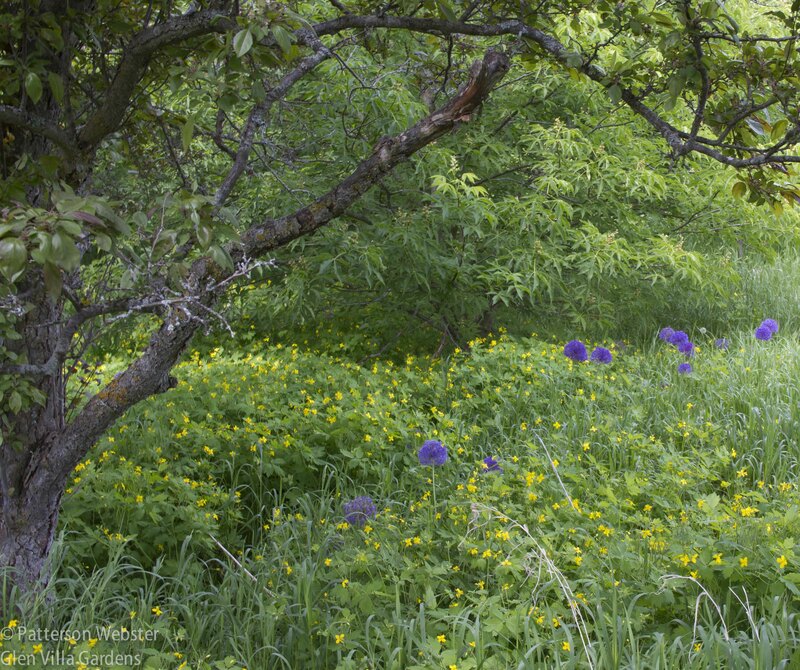 A wild area at Lilac Tree Farm was bursting with bloom in early June. I love the way the alliums poke up through the yellow flowers. Wish I could remember what they were! Wood poppies, perhaps? Also in June I saw some eye-popping gardens on New York’s Long Island when my sister and I visited private gardens on the Garden Conservancy’s Open Day. One, with a wildflower meadow recently showcased in Garden Design Magazine, was quite grand. The very large meadow was only beginning to come into bloom in late June. 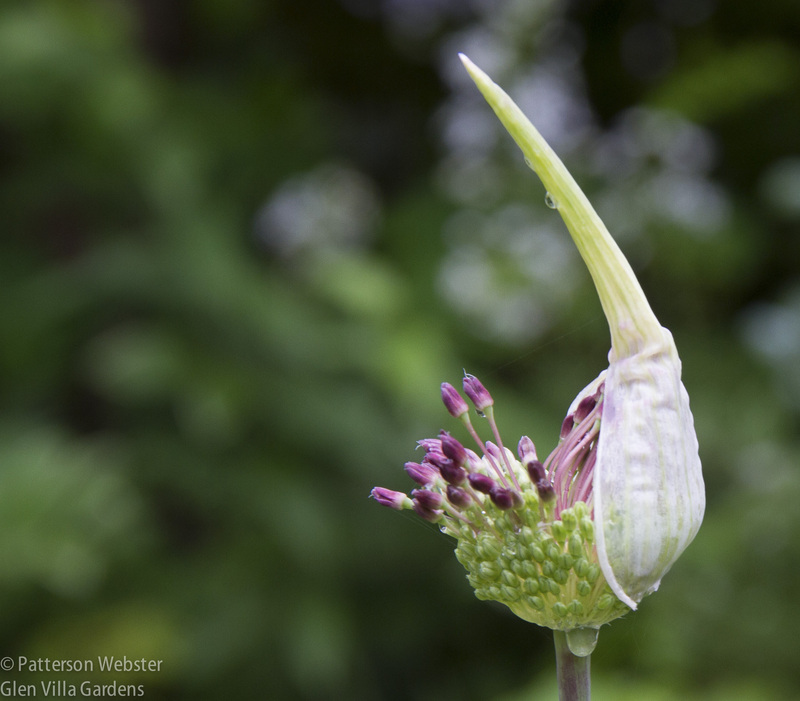 Another one, much simpler, was bursting with blooms, including this crazy-haired allium, just about to pop. Allium seemed to be the stars in many gardens this year. This one made me laugh. We visited some public gardens as well — The Madoo Conservancy, The Bridge Gardens, Longhouse Reserve, Old Westbury Gardens and the Marian Coffin-designed garden at the Nassau Co. Museum. My favourite of these was the Longhouse Reserve, although Old Westbury was an unexpected pleasure. 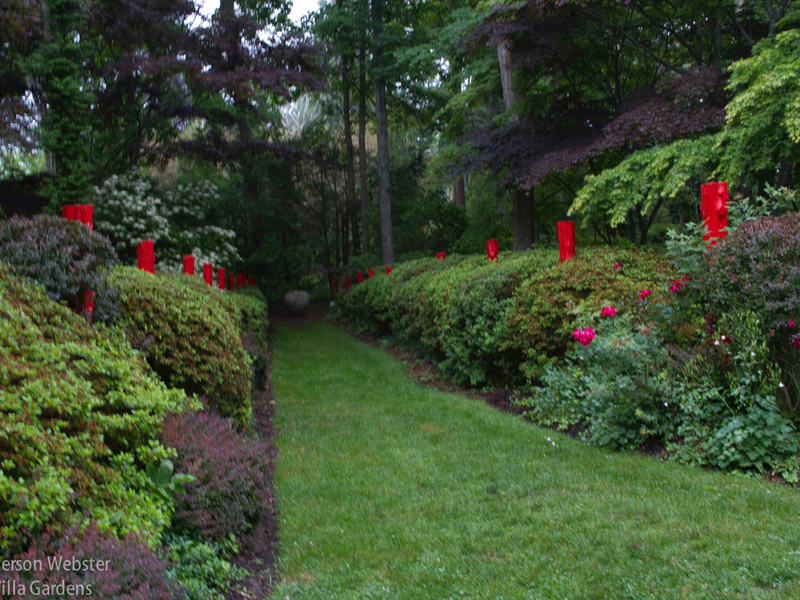 The azaleas that set off the bright red posts had almost finished blooming but the long allée was impressive nonetheless. From Long Island we travelled into New York City where we walked the High Line and peeped through the fence at the then-threatened garden designed by Russell Page. 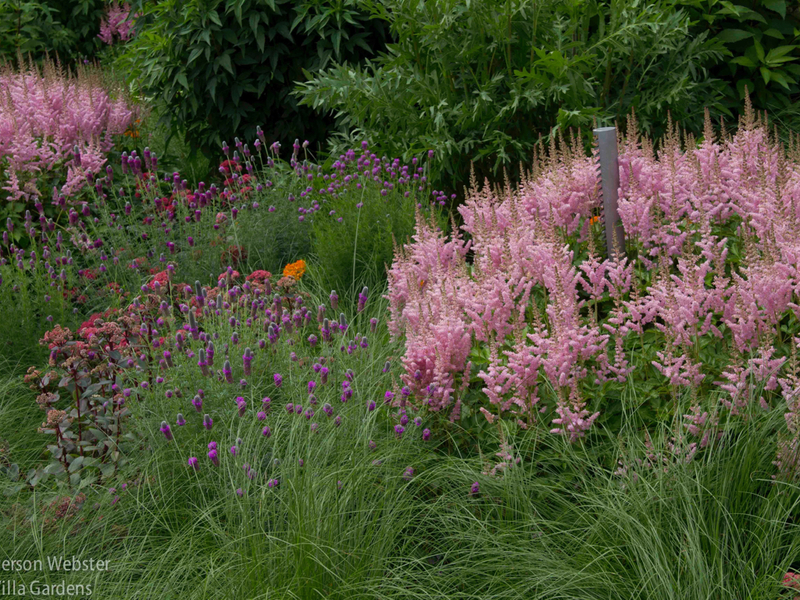 The plantings along the High Line were superb. The experience of walking through a garden in mid-air, in the middle of a busy city, was even better. 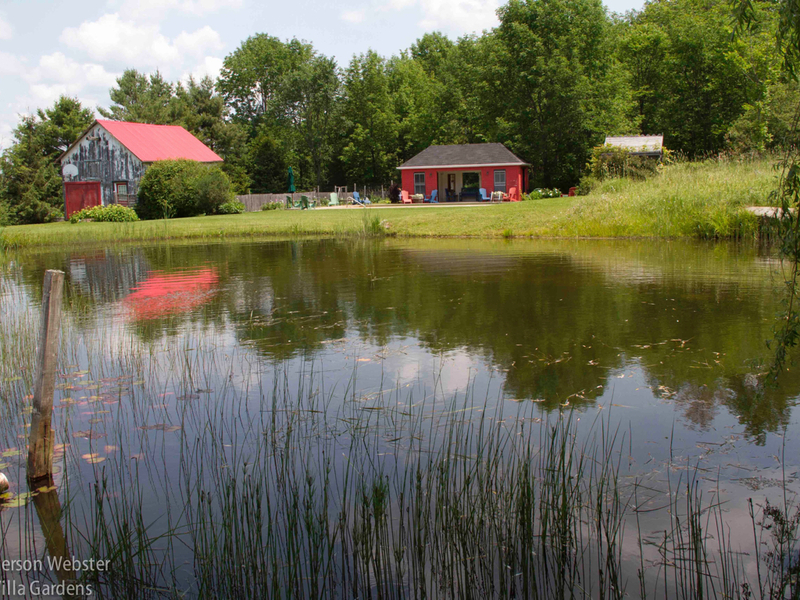 A lovely setting is enhanced by the colour of the barn roof and the blue sky reflected in the still waters of the pond. and working diligently on my own. 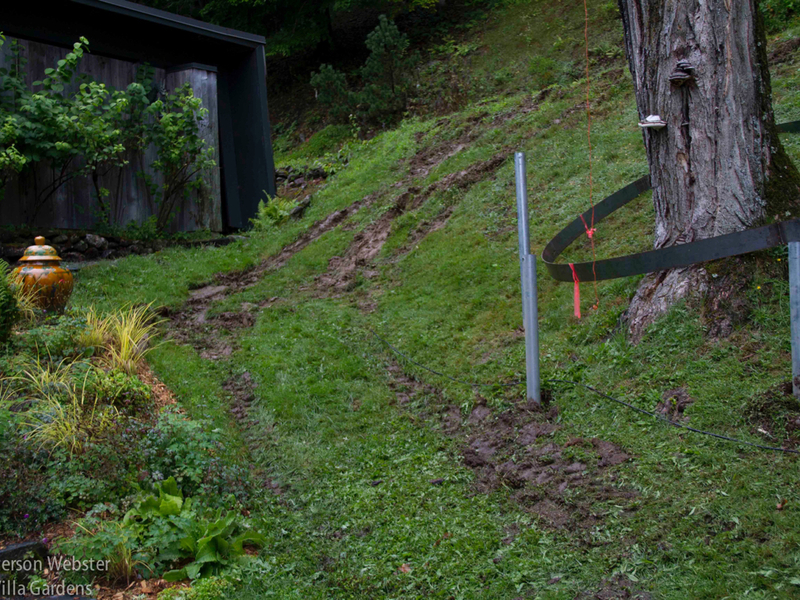 Working on the sculpture Tree Rings wrecked havoc on the grass, but only temporarily. In the Upper Courtyard at Broadwoodside, maple trees are variously mislabelled as walnut, lime, willow and other types of trees. 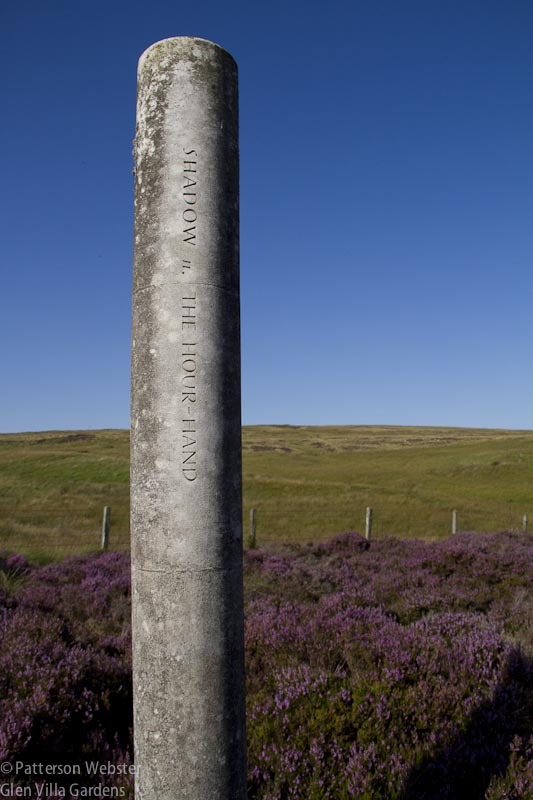 Shadow: the Hour Hand are the words carved into this stone column that rises from the low-growing heather. 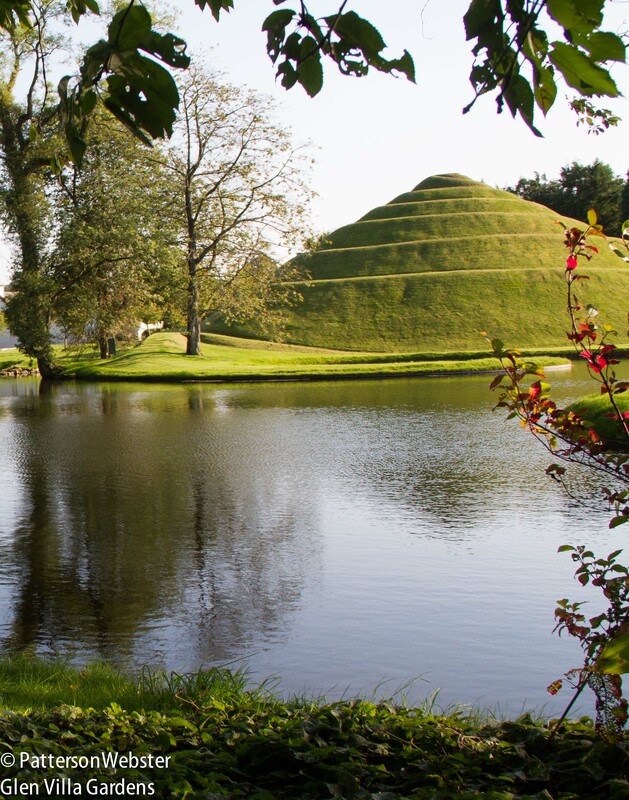 The snail mound at the Garden of Cosmic Speculation is one of two impressive land forms in this garden designed by Charles Jencks and Maggie Keswick. 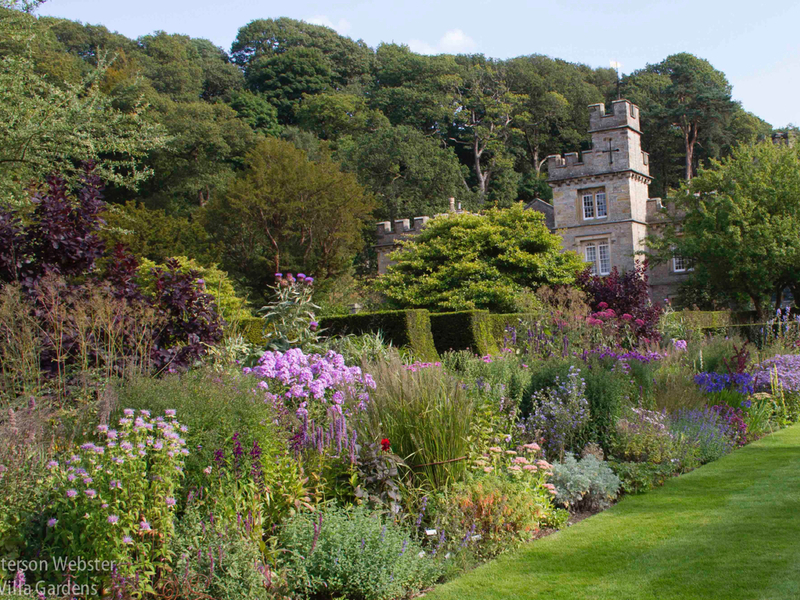 A long border, rich with bloom, showcases the talents of designer Arabella Lennox-Boyd. and Scampston Hall’s Walled Garden. 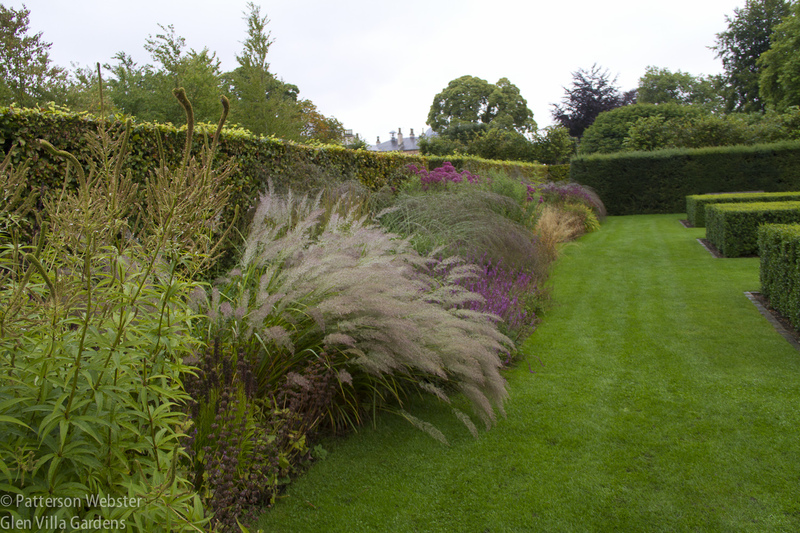 Identifying the various ornamental grasses was a challenge helped enormously by the fifteen page plant identification list. The plants are numbered. This is done so discretely that I had to search for most labels. 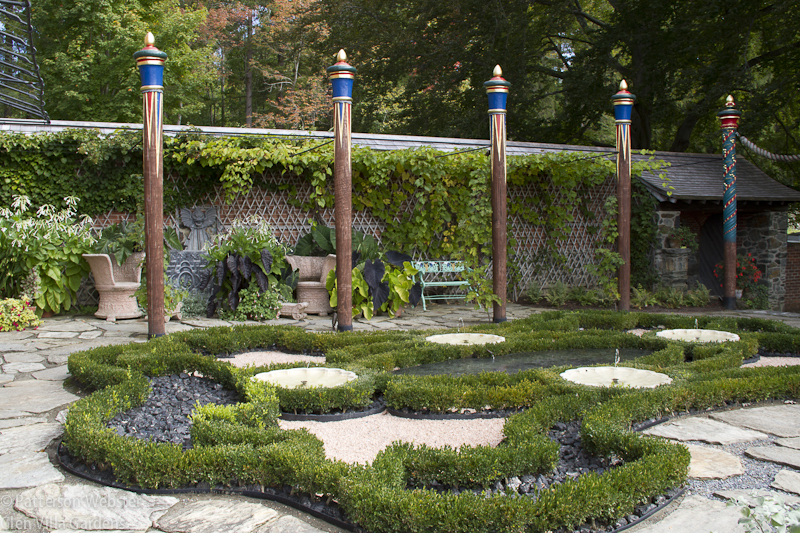 This afternoon garden at Naumkeag sparkles after a recent renovation. 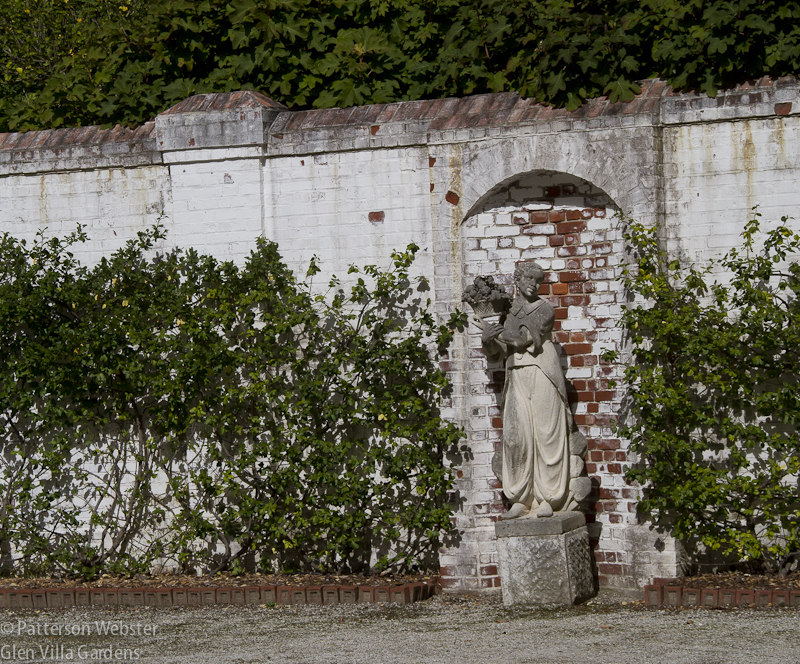 This fruitful goddess placed in the entry courtyard suits the architecture of Edith Wharton’s country house, The Mount. and some art-rich spaces, including Fruitlands, the Clark Art Institute, the DeCordova Museum and the courtyard garden at Boston’s Isabelle Stewart Gardner Museum. 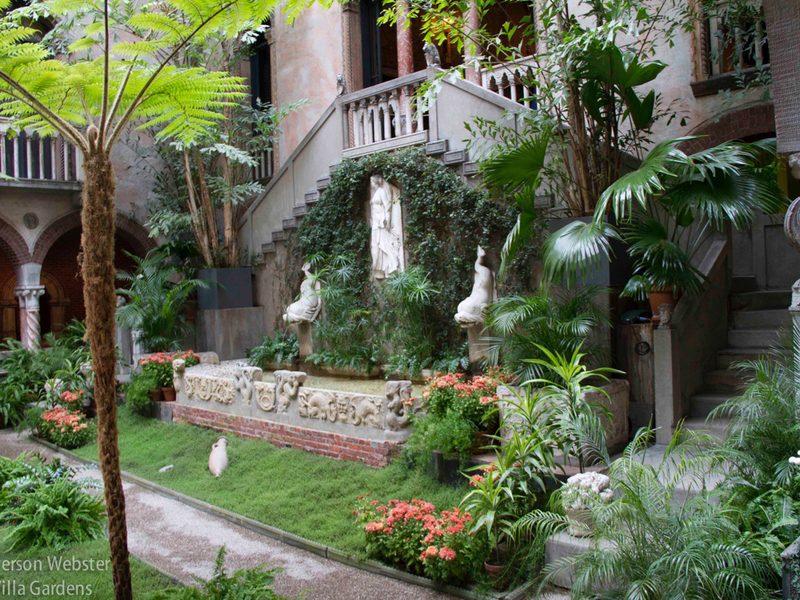 The courtyard garden is a highlight at the Isabelle Stewart Gardner Museum. I can think of some dozen or more places I haven’t mentioned. 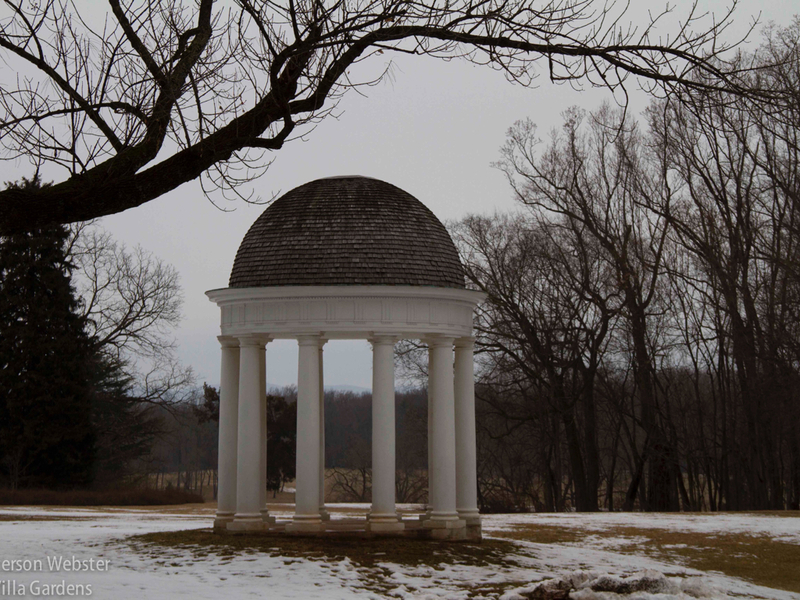 James Madison’s garden in Montpelier, Virginia, held special memories for me since my mother served for many years on the Board of Directors of the University named after him, and the gazebo in the garden was similar to one I knew and loved as a child. The gazebo reminded me of one at Maymont Park in Richmond, Virginia. The roof of that gazebo was an open patterned ironwork and I have wonderful memories of looking through the lacy roof into the endless blue sky above. The tiny gardens in Toronto’s Cabbagetown captured my heart, as did the cloister gardens in Ravenna, Ferrara and Bologna, Italy. My friend Gill’s garden in England gave me a chance to rest after hours of travelling and to breathe between hours of intimate conversations. No doubt, visiting these gardens was enjoyable. But was it more than that? Did I learn anything from them or glean ideas that I can apply at Glen Villa? I did learn from them, and what I learned wasn’t always obvious. But that’s the subject for another post. What about you? 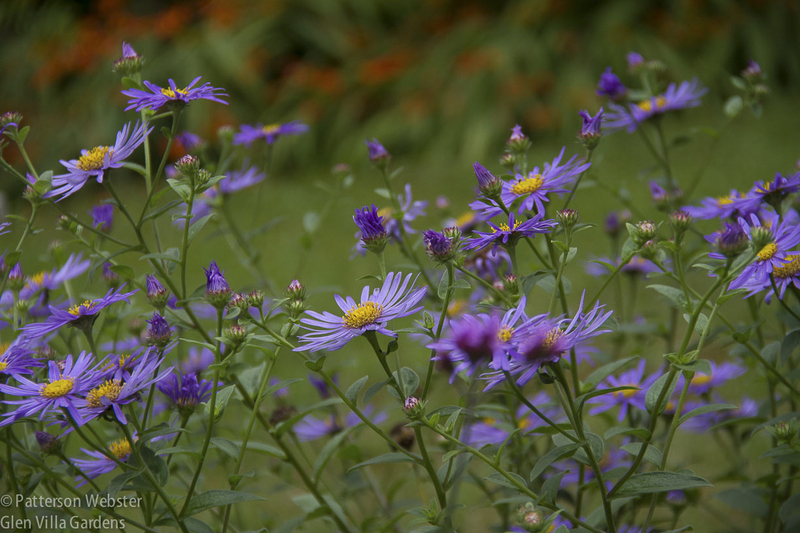 Did you visit gardens in 2015? Do you have favourites? 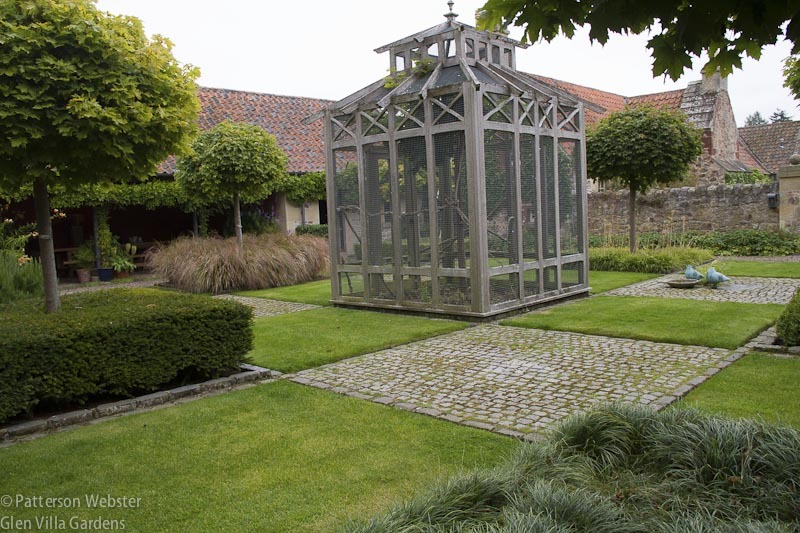 What do you look for when you visit a garden? 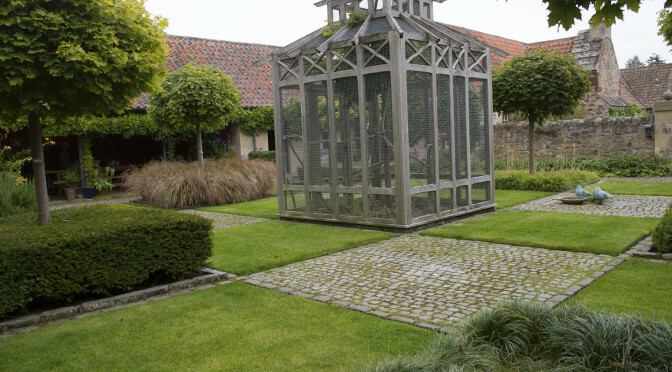 Do you expect to get ideas you can use in your own garden or do you simply enjoy the experience?